Making headlines when it was launched in 2015, Omise'eke Tinsley's undergraduate course "Beyonc Feminism, Rihanna Womanism" has inspired students from all walks of life. In Beyonc in Formation, Tinsley now takes her rich observations beyond the classroom, using the blockbuster album and video Lemonade as a soundtrack for vital new-millennium narratives. Woven with candid observations about her life as a feminist scholar of African studies and a cisgender femme married to a trans spouse, Tinsley's "Femme-onade" mixtape explores myriad facets of black women's sexuality and gender. Turning to Beyonc 's "Don't Hurt Yourself," Tinsley assesses black feminist critiques of marriage and then considers the models of motherhood offered in "Daddy Lessons," interspersing these passages with memories from Tinsley's multiracial family history. Her chapters on nontraditional bonds culminate in a discussion of contemporary LGBT politics through the lens of the internet-breaking video "Formation," underscoring why Beyonc 's black femme-inism isn't only for ciswomen. From pleasure politics and the struggle for black women's reproductive justice to the subtext of blues and country music traditions, the landscape in this tour is populated by activists and artists (including Loretta Lynn) and infused with vibrant interpretations of Queen Bey's provocative, peerless imagery and lyrics. 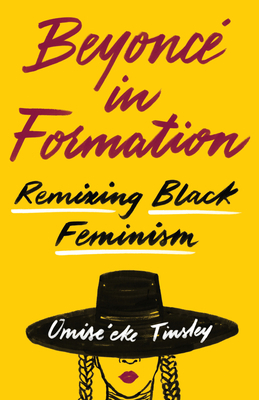 In the tradition of Roxanne Gay's Bad Feminist and Jill Lepore's best-selling cultural histories, Beyonc in Formation is the work of a daring intellectual who is poised to spark a new conversation about freedom and identity in America.